One of the most time consuming parts of painting your house or your furniture, is gathering up all of the materials that you need in order to do it. The stir sticks may be in one spot, the drop cloths stored in another, and you are left scrambling to find what you need. 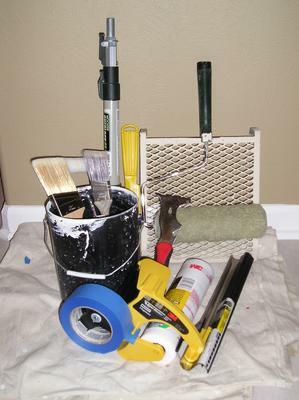 Instead of just buying new things to replace items that you cannot find, create a ready-to-go painting kit instead. By taking the time to group the items that you need and keep them all together, you will save yourself both time and money. Before you start rushing around to gather all of your painting tools and supplies, it is important to have a container to put them in. The best choice is a container that can hold everything, including your drop cloths, and that can be tightly closed to protect your tools from moisture and pests. A big plastic tub is usually the best option. There are some that are clear which makes it easy to see into them and identify which container has your painting supplies at a moment’s notice. There are others that are opaque if you prefer a neater, less visible display of your painting supplies and tools. Whichever container you select, make sure that it is large enough and that it comes with a tight fitting lid. After you have your container, start gathering your painting supplies from all over the basement, garage and shed. You may find yourself amazed at all of the different, and duplicate, supplies that you have accumulated. Once everything is together, discard those things that are broken or can no longer be used. Use large plastic, zippered bags to contain the remaining items. For instance, place all of your rolls of blue painter’s tape in gallon size zippered bags. Paintbrushes can be grouped all together, or you can separate them by size and use. Label each bag with what should be placed inside. This will help you keep track of the items as you use them and then return them to the correct bags. If, after you have gathered and sorted all of your items, you discover that you are missing some items, make a list of what you need. Each time that you go to the paint store or the home improvement store, pick up one item on your list. If you know you need a new foam roller cover, pick it up when you go to the store for screws and put it in the appropriate bag in your painting kit when you come home. It is also a good idea to keep a list of the supplies that you use each time that you paint and replace them right away. It will make it much easier to get started on the next job. By creating a kit that includes everything that you will need to complete the painting job, you will find that the job goes smoother and is a lot less expensive. You will be able to concentrate on doing a great painting job, as opposed to figuring out what else you need. Take the time to get your kit started today and see how much neater your storage area will look.